I noticed something funny the other week. We’ve been cooking for friends all winter — don’t mistake this for me characterizing myself as big-hearted or generous: During long stretches of single-digit days, these meals are acts of self-preservation as much as anything else. We’ve busted out The Ragu, of course. We’ve experimented with short rib tacos and lettuce wraps. We smothered more than one leg of lamb in mustard. There were beautiful burrata starters and warm chickpea dips and Marcella’s milk-braised pork, because I don’t know what would become of us if we went more than a month or two without serving that to someone…anyone. In spite of all our culinary high-wiring, though, it just occurred to me that we’ve only gotten a morning-after recipe request (highest praise possible in my mind) for one dish all season — a dish that requires only a few boring ingredients and, in total, costs probably under five bucks to execute: Baked Polenta. One key reason for this is because the dish is make-ahead. So at any point during the day, I can prepare my polenta the normal way — whisking corn meal into broth gradually and mixing constantly for 10 to 12 minutes — then pour it into a pie dish or a cast iron pan like the one shown in the photo, and let it set in the fridge. All I have to do when the party starts is top with cheese and throw it in the oven for 25 minutes. Another great thing: It’s completely flexible. So when I’m having lamb, I can heap on the feta before I bake. If I’m having an adobo-style pulled pork, I can reach for some good sharp cheddar. I’d go so far as to say it’s the Bill Clinton of my dinner party circuit: as down-home or uptown as it has to be depending on its surroundings. And I’d be remiss if I didn’t mention it’s perfect with roasted vegetables for family dinner any old night of the week. As usual, the fewer the ingredients, the more you want to pay attention to the quality of those ingredients. Using homemade stock here takes the dish from good to great. Not surprisingly, so does the butter and cream. Also: The photo above shows a version of the polenta without the cheese baked into it. That works, too. Grease a pie dish or an ovenproof cast iron pan with 1 tablespoon butter. In a medium saucepan, bring stock to a boil and turn down heat to a simmer. Gradually pour in cornmeal and salt, whisking as you go. Continue whisking for about 10 to 12 minutes until polenta is thick. Remove from heat and stir in remaining butter, cream (if using), and cheese. Pour the polenta into your prepared baking dish and allow to cool slightly. Cover loosely and place in the refrigerator for at least an hour and up to overnight. When you’re ready to bake, preheat oven to 425° and top chilled polenta with more cheese. (You can be generous here.) Bake for 25 minutes until warmed through, top is slightly golden, and cheese is melted or bubbly. Sometimes if I’m using feta and it doesn’t look “melty” enough, I smush it a little, then top with a drizzle of olive oil and some fresh parsley. This sounds great. After much effort, I think my community is bringing back the dinner party! We have been having people over all winter (more like extended play dates for kids so us parents can get together). Pork ragu over papperdell this saturday night! Baked polenta is definitely going into the rotation. This looks so good!! I love polenta. Does the polenta stay creamy in the center when you bake it? This is something I have yet to try in my kitchen – that will have to change. It looks delicious!! Baked cheese polenta (aka grits!) topped with crumbled bacon and a poached egg is a breakfast favorite at my house. And yes, butter and cream makes it extra delicious! KM, if you hover over the photo, a mini button that says “Pin it” should appear. Press that and voila! You can also install a shortcut button on your browser bar so that you can pin anything from anywhere at any time! thanks for your suggestion, but that option does not appear when I hover. I’m on Chrome browser, in case that matters…I don’t have the same problem on other blogs so wanted to flag here..
KM – I just updated the plug-in for the “hovering” Pin-it button. Try again and let me know what happens! Yay! it works now! Thanks so much 🙂 Off to pin more of your recipes…. So funny. I just cooked up a big batch of polenta for my weekly dinnner swap because it is much better the next day than leftover pasta. My pot of puttanesca sauce is currently simmering on the the stove. Long live polenta! I LOVE polenta. My mom makes it in the slow cooker and its the creamiest. And it goes perfectly with everything! Yum. Polenta. Cheese. Make ahead. Can’t go wrong. Gotcha. This. Pot. This. Pan. We must talk about this! Who what where when???? 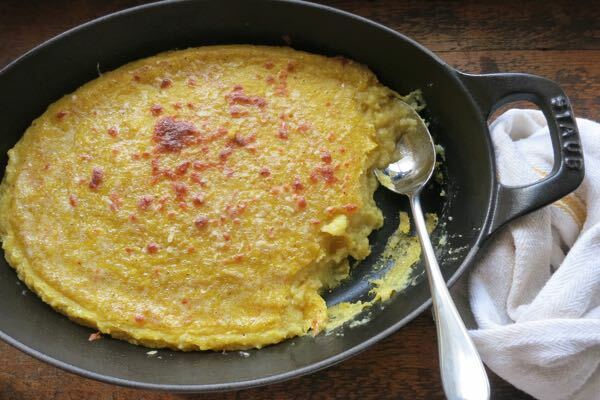 I loooove polenta and agree – it’s the perfect accompaniment! Sometimes I shortcut even more by buying prepared polenta in a tube and mashing it with milk with a potato masher. This is such a great idea! I definitely don’t eat enough polenta. Must give this a try very soon! I have the same question as Karen: is it creamy once baked? We’ve been eating polenta (once-cooked) in bowls, topped with a mixture of sauteed onion, garlic, beans, corn and green chiles (all seasoned with some combo of salt, pepper, cumin, Tropical Adobo, etc.) and some grated cheese. Meatless (unless you add some sausage crumbles or the like), but so good and satisfying, fast and affordable. Totally made this with dinner the other night. It was awesome! Not just for dinner parties, very easy to put together at breakfast and then into the oven at dinner during the week. I have a toddler, so anything for dinner that involves not standing over the stove at dinnertime is a winner. And got to use the random cornmeal in the pantry from who knows what. Thank you Jenny! Hi. I am making this today but have a question: should I use the unspecified grind from my Albers Yellow Corn Meal or the Corn Flour from Bob’s Red Mill? The corn flour is apparently a fine grind of corn meal, but is that too fine? I hope you get this post soon! Thanks! Some corn kernels, and perhaps using the water it was cooked in, is a fabulous addition. How many people will this recipe serve? What size pan is used?